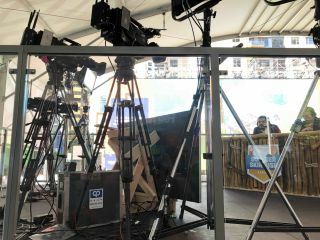 CP Communications used RF and IP convergence to bring the final events of Epic Games’ Fortnite Summer Skirmish competitive series to gaming fans worldwide. The four-day series, broadcast live from the PAX West 2018 gaming convention at Washington State Convention Center, was live-streamed to the official Fortnite Twitch.tv channel and social media platforms worldwide. CP Communications brought its flagship HD-21 RF truck to Seattle as a central point to manage signal acquisition, distribution, and transmission between a gaming competition room, an outside production set with live announcers and a large projection screen, and an NEP outside broadcast truck. Upon evaluating options, the CP team brought the best of its technical capabilities to architect a highly efficient networked architecture of convergent RF, IP, and WiFi systems. Heitmann notes that this project represented the value that CP Communications team brings in “connecting the engineering dots,” and making use of all available tools, technologies, and topologies available today for mission-critical live production and transmission.